Dorling Kindersley is one of my favorite publishers, I have two excellent reference books by them called ‘The Knitting Book’ and another one called ‘The Sewing Book’. I’m quite bad at learning things in order 😉 I tend to find a pattern I like, then go to look up how to do the required techniques for it,both these books have been great for that. Earlier in the year, I decided that I’d like to give crochet a try, and bought a couple of magazines to help me learn. Now where magazines are great for motivating you; creating a square each week in a new stitch etc, it takes a long time and costs a fortune to learn basic techniques this way. 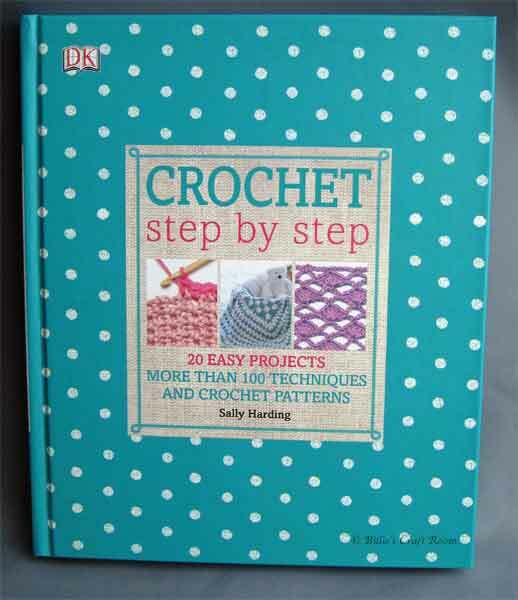 I bought this Crochet Step by Step book, so that I had a reference point to look up techniques and find out more about basic crochet. Hard backed book. This is great, as it’s the kind of book you will refer to a lot and its helpful that it lays flat on the desk as you use it. Clear photos of stitches/techniques being demonstrated. Written notation as well as stitch symbol diagrams. Lots of stitch patterns, so if you are adventurous and want to fly solo to create your own projects, you could do so. Edging stitches, great if you have crochet a project and want a fancy edge, but also ideal to pretty up the edge of knitted projects too. Projects: Something for all the family. A great book if you are looking for projects to create for gifts for friends and family as well as something special for yourself. Projects at different levels so you can get on to more intricate projects as your skills improve. The small format feels quite cramped. Not as spacious or easy to read as the larger formats. Small typeface size, the print is both small and as other people on Amazon mention, pale for the body text. Some duplication of information, if you already have ‘The Knitting Book’. Yarns, yarn weights and yarn labels will inevitably be the same for both subjects. The Choosing yarn colours is also the same in both books, as is; ‘Other equipment’. Since these are stand alone books and some of the information for knitting will be the same for crochet it’s not a criticism, just something to be aware of, if you have the other book. Excellent, a good grounding in the subject, something for all abilities and a great quick and clear reference guide. Suitable for different ages and abilities. I’d think children of ten years and over, with help, could follow some of these techniques. Yes, I bought this blind from Amazon, but if I’d seen this in a store this is definitely the one I’d choose. I’ve seen others but this is an excellent way of finding the information you want, easily. Love this book, lots of projects I’d really like to make. The small size makes it easier to move around than the others I have by the same publisher, but I would have preferred the larger format. The print size is small and it all feels a bit squashed up. I’d rather have had the bigger format, for more room for each technique. If you want to get started with crochet, or try some new stitch patterns, or add some decorative edging to knitted projects, this book is for you. A concise reference guide to get you going. If you are the kind of person who wants the technical detail, so you can use the techniques in your own projects, this is ideal. You could learn the stitch patterns to begin with , then create your own projects as your abilities grow. Projects for all ages and tastes, stuff for the little un’s but not so much that if you aren’t knitting for kids you feel a bit cheated. The scarf, shawl and hats would suit all kinds of ages, from teenagers to the silver foxes. This would also be a good book to have to hand if you were teaching a younger member of the family to crochet (or like me, trying to learn without anyone else to show you the way). The pictures make it easy to see what you are trying to achieve and there are some smaller projects, like the booties, flowers or granny squares that wouldn’t take too long. A small length of the edging stitches could be used to ‘alter’ clothes you already have, so would be an afternoon kinda project, not needing huge amounts of yarn. Keep up the good work DK, these kinds of books are fantastic. Small is beautiful, but big is easier to follow new techniques you haven’t tried before. Thank you for not following the trend for ruining good reference books but putting patterns behind the text! Have seen many books I would have bought but can’t read over patterns.